Perhaps keeping backyard chickens in a down economy is analogous to the way sales of candy and beer spike up in a recession; when financial stresses loom, we do what makes us feel good. A New York Times article remarks on both the data reflecting the spike in chicken keeping (hatcheries say this is their best year, ever), and calculates the cost of feeding and housing hens compared to the price of eggs (the fixed costs of the often-pricey and whimsical coops are what keep most chicken keepers from ever breaking even). Next is a rundown of the cost of raising and feeding "broiler" chickens (meant for food), about $8 each, compared to one restaurant chain offering chickens for $1.99, cooked. The numbers don't necessarily make sense, so I turn to the real bottom line. Call it a different strain of "consumer confidence." It's a "sense of security" says one chicken keeper; another says his home-raised broilers "definitely will taste better." Still another calls her flock of laying hens her "trump card." 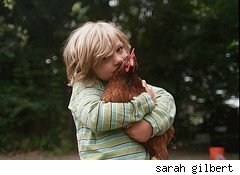 Quotes from my local backyard chicken keeping e-mail list are even more ebullient: "These chickens are like family to us," says one woman; "I could just burst!" says another, when her hens laid their first eggs. This isn't about saving pennies on eggs, in the same way we don't cooly put a new line item for 71% cocoa dark chocolate bars ($25 a month) when our partners lose their jobs, or we have our hours cut back at work. Keeping chickens -- and, in fact, growing vegetables and fruits -- in our back yards isn't something you can suss out with an Excel spreadsheet. It's visceral, satisfying, deeply connecting; it gives a feeling of power and magic in a universe of fear, powerlessness and senselessness. We can't count on our employers (they'll just lay us off); our elected representatives (they'd rather play up worries of "privacy" and "rationing" than give us sensible options for universal health care); corporations (it's clear profits and bonuses matter way more than our health or safety or happiness). But every day, we can count on that loud, primal be-gawking, the circling of the nest, the safe delivery of a home grown egg.